With the emergence of social selling, business relationships are moving out of the conference rooms and into social networks. In conjunction with other inbound sales tactics, your social profiles can make or break a deal. Optimizing your LinkedIn profile is the first step towards successful social selling in the digital age. Start by making your LinkedIn profile “sales ready” with a professional photo and a strong headline. Ensure your headline projects creativity, appeals to your target market, attracts the right people and answers the questions, “Who do you help and how do you help them?”. Use your summary to expand on your personality and experiences, by describing what you do and why you do it. Next, create a personalized LinkedIn URL to increase searchability and finally, add your contact information so prospects can connect with you in their preferred method. 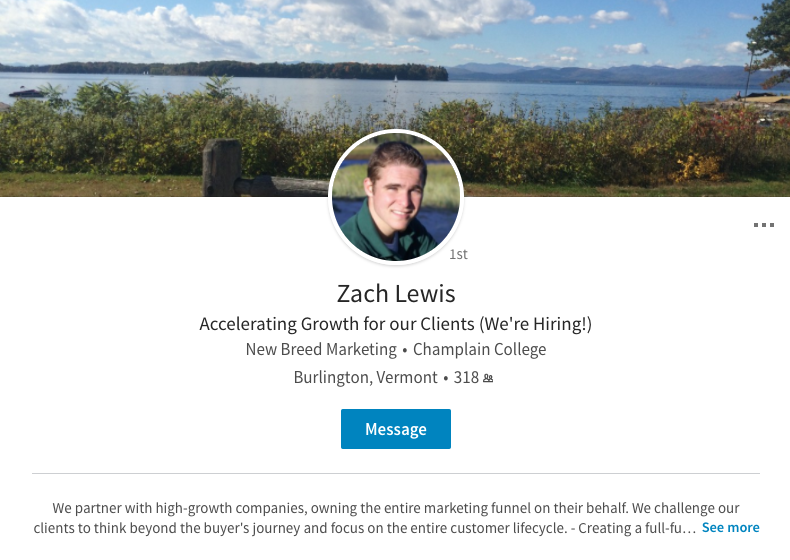 Fill out the “Experience” section of your LinkedIn profile with your buyer persona in mind. Include relevant blog posts and other content that would resonate with your buyer personas. List 3-5 major role responsibilities under your description using industry specific long-tail keywords. Show your skillset rather than just talk about it. Mention awards or impressive stats that you and your company have earned. Intrigue your viewers by highlighting the value that you bring and keep the focus on the results you’ve helped clients achieve. Qualify leads that hit your LinkedIn profile page! Identify aspects of your buyer persona within your experience section, such as company size or industry, so prospects can understand why they should or should not be interested in talking to you, and can then self-select as a good or bad fit. List accomplishments in the form of certifications, courses completed, and/or awards won to show off your talent rather than just talk about it. Aim for a high number of endorsements for individual skills pertinent to your buyer personas and a few recommendations from past supervisors or clients. Strive for two recommendations for each of your most important former positions. Wait six months before asking for recommendations and be specific in what you want to be recommended for. Client recommendations are also a powerful referral tool and are a high-quality trust signal. Strive for a high quantity of endorsements that your buyer personas would be impressed with. Make sure to identify which skill is of importance to your prospects and start by trading endorsements with the people you know. Customize your message to the business, experience and personality of the prospect you’re connecting with. Provide value before extracting it! Don’t ask for anything when you’re connecting for the first time, work your way up to it naturally. Social selling is about building relationships and working a network of individuals, not just one lead. Share content with your connections to show that you’re an active and knowledgeable member of your industry and spark conversations with prospects over time. In conjunction with sharing, interact with your connections to strengthen your community. Request recommendations and endorsements from your past co-workers and current clients to build your credibility. Comment, like and share your prospect’s content when you can provide value. Groups are a valuable resource for like minded individuals and can support you on your way to social selling greatness. Lastly, expand your network in meaningful ways, connect with past coworkers, schoolmates, and colleagues, as well as the prospects you’ve already engaged. Optimize your LinkedIn profile for a higher chance of showing up in the search results. The first step is to completely fill out your LinkedIn profile and switch it to “public”! LinkedIn gives higher authority to profiles that are 100% completed. Then, check your professional headline, job title and job description for long-tail industry specific keywords that speak to your prospects. Focusing on one long-tail keyword for your job title and optimizing your job descriptions around a variety of secondary keywords will improve your profile’s visibility. Make sure to change your LinkedIn URL to a customized SEO friendly version following the format (www.LinkedIn.com/in/yourname). There is potential for LinkedIn’s search engine to prioritize results based on popularity rankings. If so, endorsements will play a key role in your profile's visibility. Either way, increasing your endorsements will improve the value of your profile, so it’s a worthwhile task regardless. Add your LinkedIn URL to your email signature, other social channels and any website you maintain to create inbound links to your profile. Be active! Profiles that engage in groups and discussions are five times more likely to be viewed. LinkedIn is the main driver when it comes to social selling, but it can be supported with other channels. Social platforms like Facebook and Instagram are a little too personal and are often private. Twitter, however, is a perfect blend of both personal and professional that can accelerate your social selling. You’ll find a more robust personality on Twitter compared to LinkedIn. Information the individual tweets/retweets will shed light onto their pain points or values, and you may discover a door opener in the process. Not only can you independently interact with prospects, you can also create personalized lists and monitor their activity. Optimizing your Linkedin profile for inbound sales will provide the first step towards successful social selling. Ensuring that each aspect of your profile is fully optimized, speaks to your buyer personas, uses the right language, and shows your value will increase your visibility and encourage leads to reach out.